Conflict Minerals Declaration for the Dodd-Frank Act. Burnett & Hillman fully supports the compliance with provisions of Section 1502 of the DODD-FRANK ACT pertaining to the use of Tin, Tantalum, Tungsten & Gold, as well as any other derivatives thereof determined by the United States Secretary of State (Designated Minerals) originating from the Democratic Republic of Congo (DRC) and neighbouring countries. Burnett & Hillman are currently unaware of any of these Designated Minerals being used in our products. Raw material stock is Bright Steel to either 11SMnPb30 or 11SMnPb37 Standard as is therefore devoid of Conflict Minerals. Please be assured that Burnett & Hillman will carry out adequate diligence to ensure that no Conflict Minerals will be present in our products. Burnett & Hillman are dedicated to supplying high quality hydraulic adaptors that meet environmental regulations, including RoHS (Restriction of Hazardous Substances) Directive 2002/95EC, RoHS2 Directive 2011/65/EU. 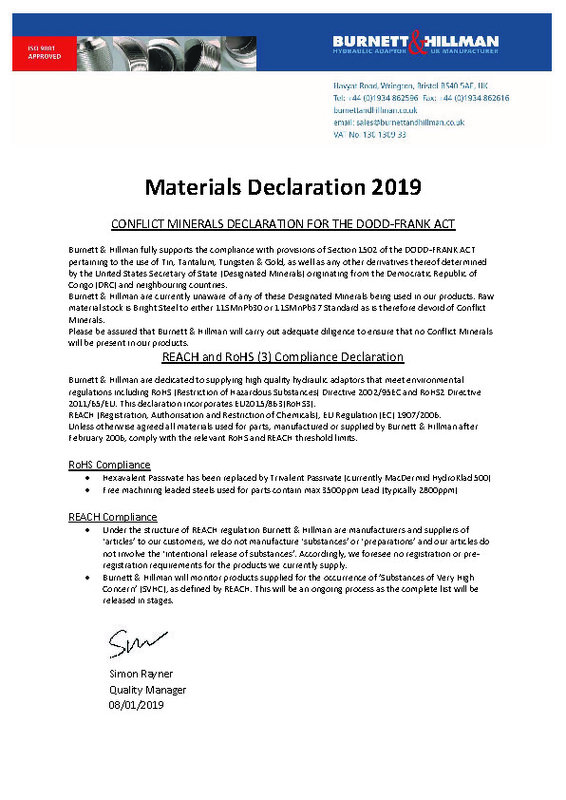 This declaration incorperates EU2015/863(RoHS3). REACH (Registration, Authorisation and Restriction of Chemicals), EU Regulation (EC) 1907/2006. Unless otherwise agreed all materials used for parts, manufactured or supplied by Burnett & Hillman after February 2006, comply with the relevant RoHS and REACH threshold limits. For our formal declaration please download our declaration letter.